ONE OF THE issues I have been known to occasionally sound off on is excessive RV weights, particularly in caravans. 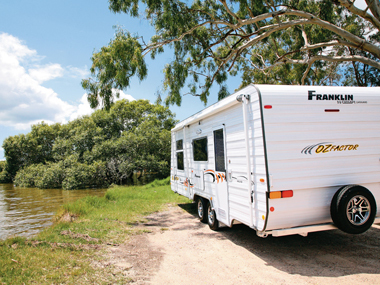 I am so hot on this topic because weight is very important as far as the tow vehicle is concerned and the way a caravan tows is a matter clearly related. Different combinations of tow vehicle and van can produce different towing results and there are some vans, even larger ones, that are more comfortable than others (in terms of ride) to tow. 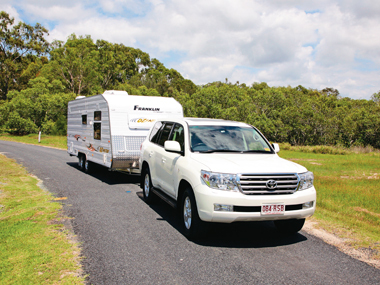 All of this talk of weights and towing came up in a conversation with Qld dealer Gary Kratzmann. 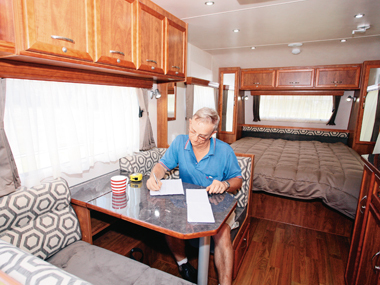 I was at his Burpengary dealership to collect one of his latest caravans, a Franklin Oz Factor, and he was naturally keen to mention the van's features and attributes. When I mentioned the review van, particularly with its front bedroom/rear bathroom layout, looked like a few others I had seen, Gary very quickly pointed out it's the features you can't see that make all the difference. 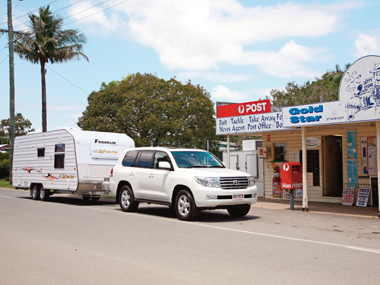 The Kratzmann team, in conjunction with the van's manufacturer, had been especially keen to get this 6.43m (21ft 1in) Oz Factor within the towing limits of a five-door Toyota Prado (2500kg) and make it a smooth tower. There are several factors involved in making a comfortable towing van, but one of the keys is the location of the axle, which also affects the towball weight - too far back can mean excessive weight on the ball, and too far forward reduces that figure but usually results in stability problems. According to Gary, the design team has been testing various axle positions to get the optimum result. I was a little skeptical of that process, but after taking the Oz Factor for a spin behind my LandCruiser I must admit to finding it a very smooth towing combination. Looking at the weights, when I found this Oz Factor came in with an ATM of 2329kg - around 250-300kg lighter than a usual 6.43m (21ft 1in) van - I was wondering how some of it had been trimmed. Closer inspection revealed no signs of corners having been cut. Instead, the weight has been saved in items such as European ply for all of the cabinetry. I'm not sure why, but the Germans seem to have cornered this particular market and their products have a great strength-to-weight ratio. 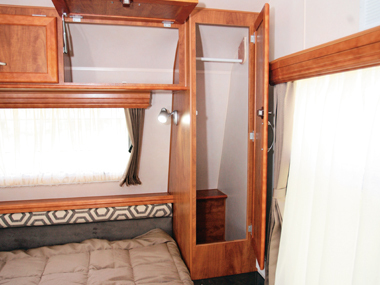 That same European ply has been used to create a spacious and comfortable rear bathroom, done in a mid-tone timber stain which, together with glossy laminate benchtops, uniquely-patterned seat backs, and simple curtains and bed spread, creates an interesting look. 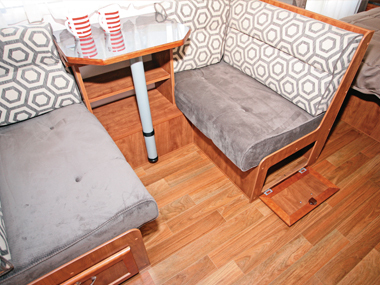 The nearside dinette is located in the middle of the van and its wall cushions make it a great place to dine or relax. Not only are the cushions comfortable, but the tri-fold table can be set back to make plenty of room. There are a couple of open shelves, rather than the more usual cupboard, under the table. Under-seat storage is accessed by floor lockers. 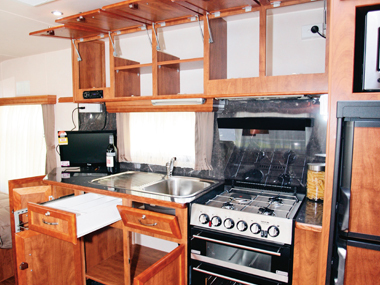 Opposite the dinette, the kitchen comes with the full kit - four-burner cookop/grill/oven, stainless steel sink and 186L two-door fridge, with LG microwave above. The fridge's controls are at floor level, a design not favoured by grey nomads with wobbly knees and arthritic hips. The kitchen cabinet is just long enough to include a nominal amount of bench space, which is slightly less than it might be because of the chamfered corner designed to allow better bed access (there is always a compromise somewhere), and the swivel-arm flatscreen TV. Kitchen storage is a mixture of lower cupboards, one with a slide-out wire basket, and overhead lockers, two with an extra shelf. The only drawer is home to the cutlery, but there is a full-height cupboard beside the entry. This is not particularly deep, but it would make an excellent pantry. Forward of the dinette, the bedroom is brightly lit by day with windows all-round, and by a bank of ceiling-mounted LEDs by night. There is also a pair of reading lights. The innerspring mattress sits on a posture slat bed base and measures 1.85x1.53m (6ft 1in x 5ft). Lifting the base reveals a substantial open storage area. 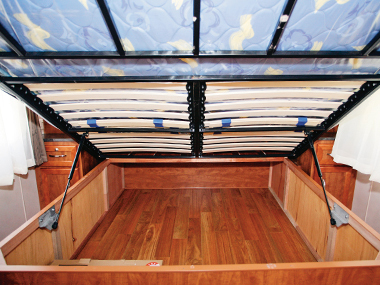 In terms of storage, there are a few bedhead lockers and two half-height corner cupboards at the base of the bed. 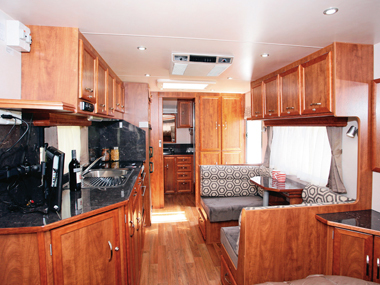 The flatscreen TV can be swivelled so as to be seen from either the dinette or the bed. Additional entertainment is provided by the radio/CD player, which also includes a 3.5mm MP3 connection and a shelf to park the device. 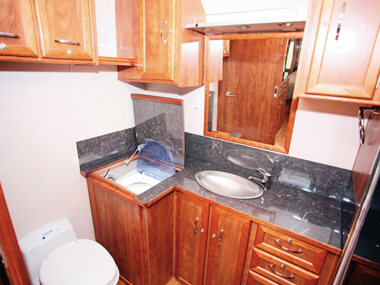 The rear bathroom is larger than most, accommodating a washing machine in the offside corner, as well as a roomy shower cubicle on the nearside and a Thetford cassette toilet opposite. Given the space, there is a copious amount of cupboard and drawer storage available. From the outside, the Oz Factor looks quite familiar. Built on a tandem-axle SupaGal chassis, the van has a timber frame, aluminium cladding, Camec security door and tinted bubble windows. There is also an awning and fold-down picnic table. 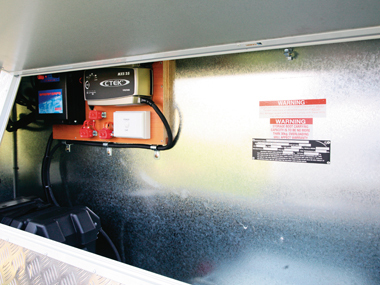 A front boot provides the only external storage and two 9kg gas cylinders ride on the drawbar. In addition to the various hatches, the roof also supports a TV antenna and Dometic air-conditioner. Although the OZ Factor is not a new model as such, it is an update and refinement of a successful existing model - something many dealers have been doing of late. However, this refinement, when coupled with some significant reductions in weight, almost makes this Oz Factor a brand new design. 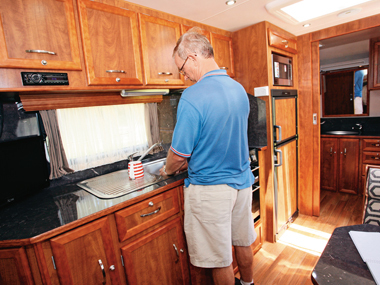 All of the van's best features - large bathroom, strong build - have been retained, the not-so-good ones have been modified, and the latest technology has been included. The result is a comfortable and steady touring rig. 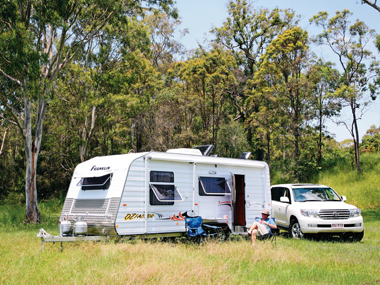 Source: Caravan World May 2012.